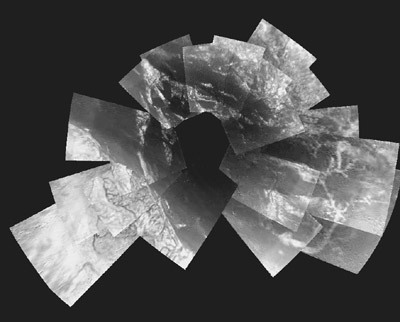 This picture is a composite of 30 images from ESA's Huygens probe. They were taken from an altitude varying from 13 kilometres down to 8 kilometres when the probe was descending towards its landing site. View all raw images. At that stage of its descent, Huygens was dropping almost vertically with a speeed of about 5 metres per second. It was drifting horizontally with a speed of about 1 metre per second.